When it comes to flat roofs, look no further. Your roof takes a brutal beating every single day from weather and the hot sun. Unfortunately, it’s one of those things that most business owners end up forgetting about. That is until you come into work one day only to find a collapsed roof. Here at R.B.T Construction Roofing Division, we know that you pour your blood sweat and tears into your business, and you want to protect your investment. A TPO roof is a great option for those who want to get the job done quickly but still want the highest quality roof available. If you’re searching for TPO roofing in Texarkana, TX call the professionals you can trust at 903-691-0931. TPO roofing is similar to other roofs in the sense that it is a single ply membrane, but it’s just a little bit different. TPO or thermoplastic polyolefin is a type of plastic or lamination that is applied to the whole surface to ensure it’s watertight. Why should I use TPO? Find out why you should consider TPO roofing for your Texarkana, TX commercial property. Eco-friendly- The sun beats down on your roof every day causing it to just soak in the heat. Unfortunately, this can lead to increased energy consumption which is bad for the planet, and worse for your wallet. Fire resistant- No one wants to come in the morning to find their business sitting as a pile of ashes. One of the great things about a TPO roof is the fact that it’s flame resistant, so you can rest a little easier. 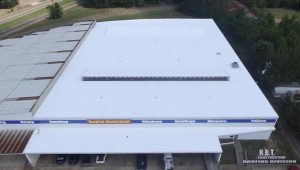 Great fit- A TPO or thermoplastic polyolefin roof is a great option for those that need to cover a peculiarly shaped roof. Years of service- How long do you plan on owning your business. If it’s for any considerable about of time then you’re going to need a roof that’ll last you. In most cases, a TPO roof will easily last 20 years. Why use R.B.T Construction Roofing Division? Here at R.B.T Construction Roofing Division, we’ve been providing quality service to the Ark-La-Tex for over a decade. We pride ourselves on honesty and integrity, and will always do the job right the first time. So when you’re looking for TPO roofing in Texarkana, TX call the experts you can trust at 903-691-0931. Updated on September 6, 2018 at 1:41 pm by R.B.T. Construction Roofing Division.